These eye-catching, beautiful butterfly flowers in brilliant pink sparkle in the summer sun. 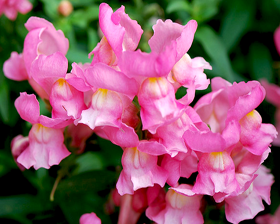 The stocky and compact plants are long flowering and excellent for beds, borders and containers. Germinate from February to May at 18-20C on the surface of a good free draining, damp seed compost. Do not cover the seed. Place in a propagator or seal container inside a polythene bag until after germination which usually takes 10-21 days.